Miraval was selected as a Top 10 Destination Spa by Travel + Leisure, offering intimate luxury where the air and water are pure. Located in a pristine portion of the Sonoran Desert, hospitality joins a healing mission to help people balance their lives by living mindfully. 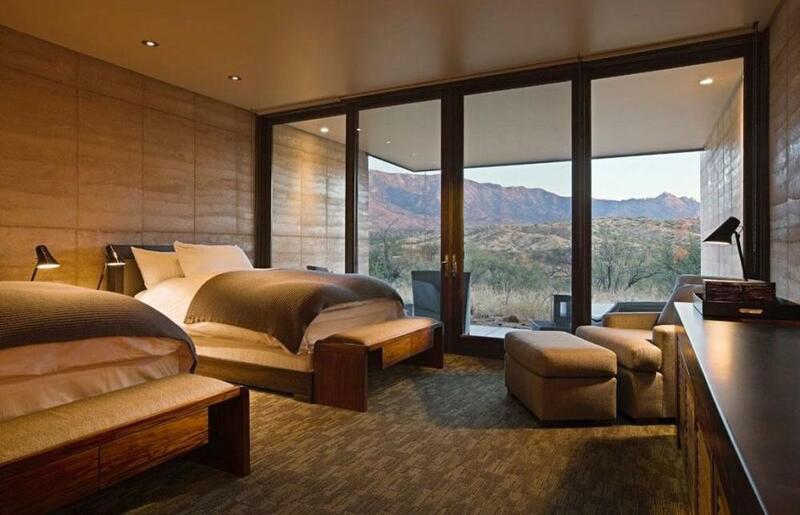 These new guestrooms, combining the desert’s rich human history with sustainable practices, for the first time bring Miraval’s physical environment in line with its award-winning spa experience. The guestrooms are Miraval’s first realization of an ambitious 110,000 square foot environmentally intelligent expansion. Placed on the resort’s desert edge, they integrate sustainable living with restorative effects – maximizing the benefits of the desert’s unique properties, conserving natural resources, reducing waste and promoting wellness. 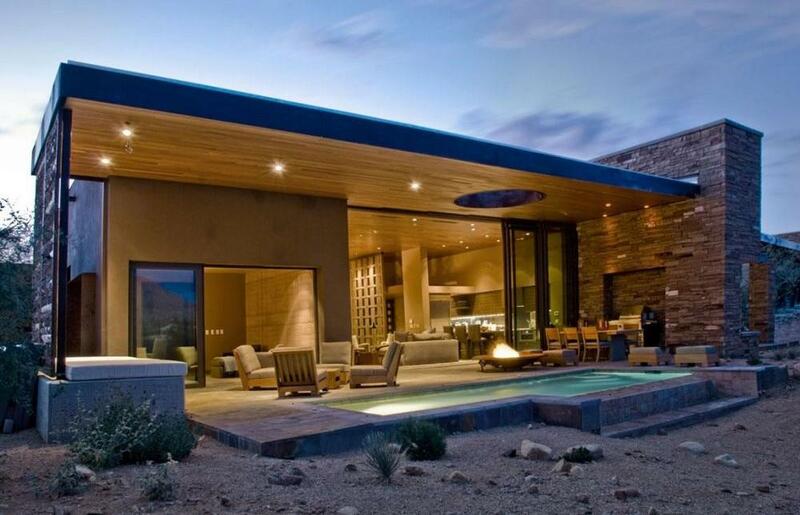 Located at the base of the Catalina mountain range, 35 miles north of Tucson, Miraval occupies the Sonoran Desert’s pristine upper portion – under clear skies free from development. The resort borders a national forest to the east, and urban communities to the west and north. A vast watershed, draining the central valley of the Catalinas, passes through the site and continues south. Ocotillo, saguro and barrel cactus mix with acacias and mesquite. Coyotes, rabbits, javalinas, snakes, raptors and dozens of other bird species make their home here. Miraval took root in the desert twelve years ago, although the site has been inhabited off and on for the past 12,000 years. 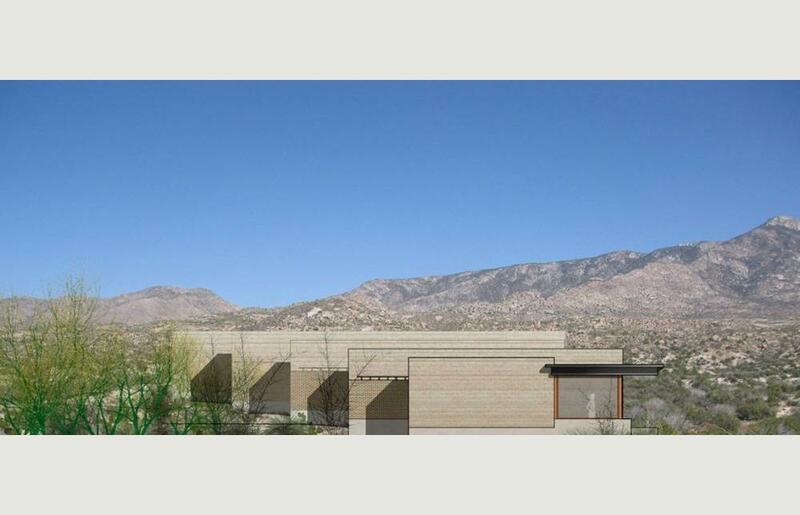 Sweeping views to the south and east connect the Catalina Mountains to the resort’s campus and establish its world-renowned character as a place for contemplation and healing. Extensions of the desert’s arroyo system also reach through the site. Elevation, habitat and natural hydrology combine to blur the campus edge with the diversity of the greater landscape. By starting to live in balance with the natural environment, Miraval is acknowledging its role in the desert as one small portion of a larger experience. Situated along a lower terrace, five buildings amounting to sixteen new guestrooms define and interact with Miraval’s desert edge. 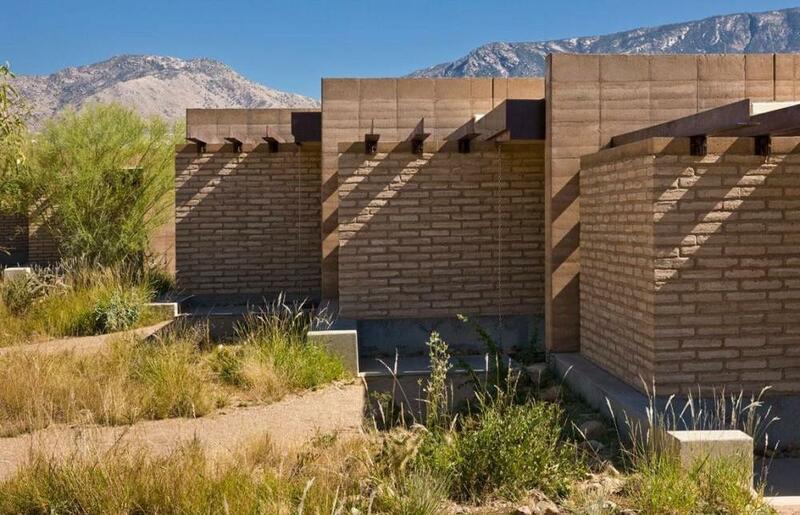 These structures, comprised mainly of rammed earth walls, seemingly grow out of the site. The arrival experience features the earthen walls, as guests descend down gentle, meandering paths that turn into a private entry for each individual guestroom unit. 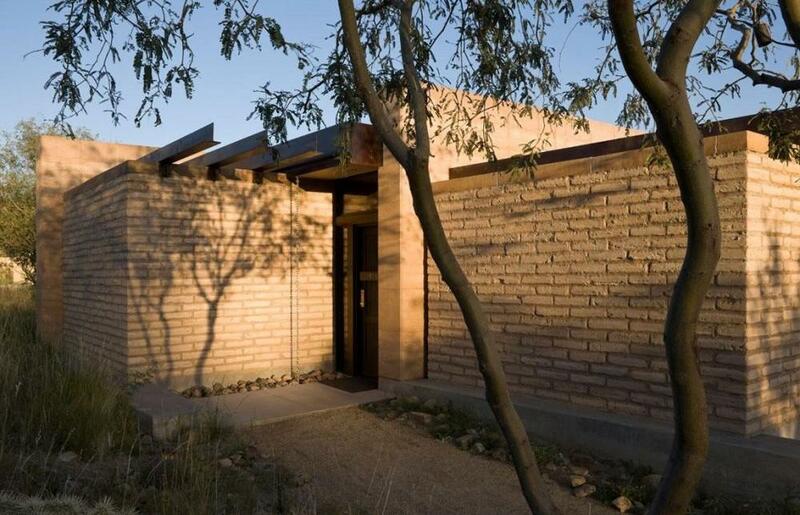 Adobe brick walls create a small, private courtyard adjacent to the entry. 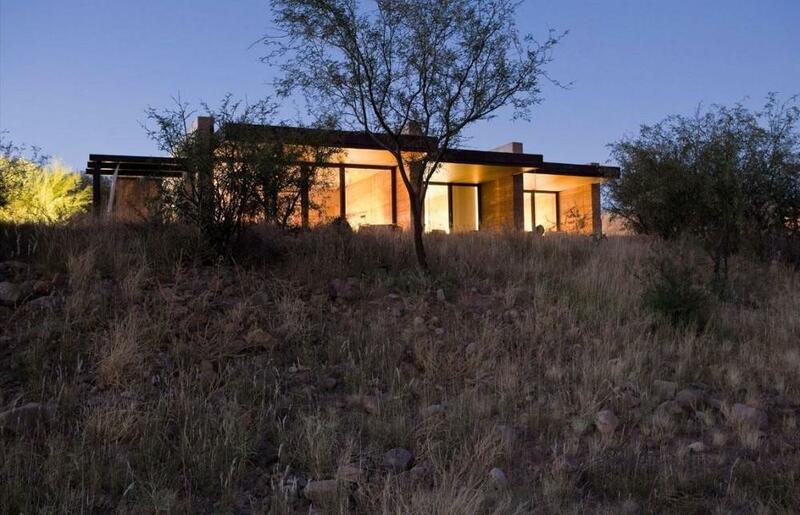 Solid rustic wood doors, earthen walls, crisp ceiling planes and floor-to-ceiling operable glass windows face the desert and the Catalina Mountains beyond to define the interior space. The ceiling plane continues beyond the glass wall to form a deep shaded terrace – a private outdoor “room” from which to take in the breathtaking beauty of the native landscape. The bathroom also takes advantage of the small trellis-covered courtyard adjacent to the entry that contains a private outdoor shower. Supporting Miraval’s commitment to healthy living, the guestrooms provide residents with a high performance built environment that respects the surrounding natural landscape. 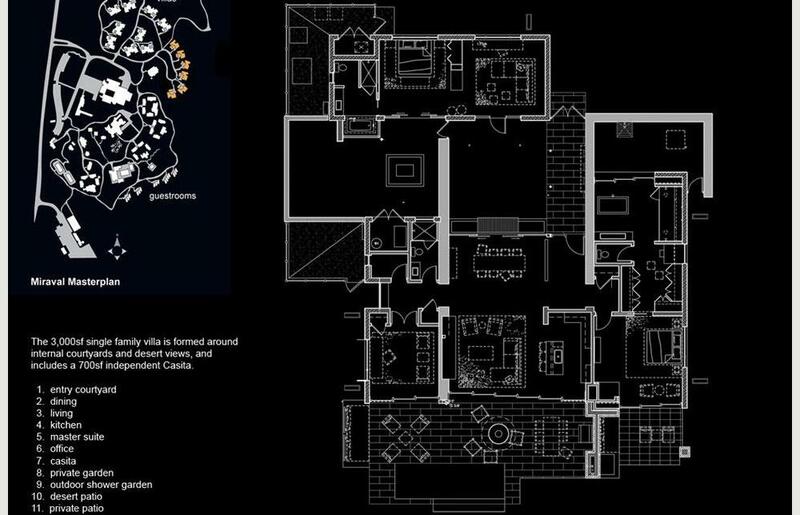 Miraval’s stated design goals include creating healthy buildings, communities and social environments that promote optimal health and well being according to a guest-driven desire for luxury, as expected for a world class resort. Durability, longevity and low life-cycle costs all protect the client’s investment, as well as Miraval’s reputation and campus-wide sustainability efforts. 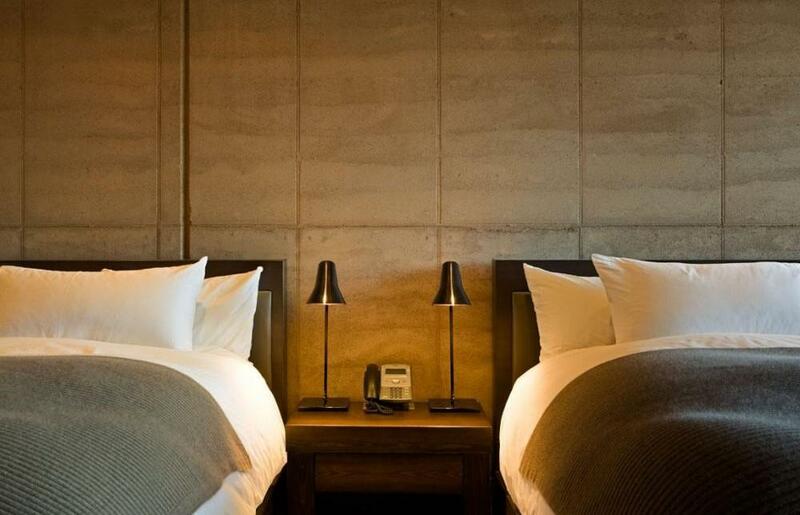 The design connects the guestrooms to their rugged surroundings using simple, durable and natural materials suited to the dry climate. Resisting ornamentation, they convey authenticity while heightening a sense of luxury next to the guestrooms’ hospitality features. 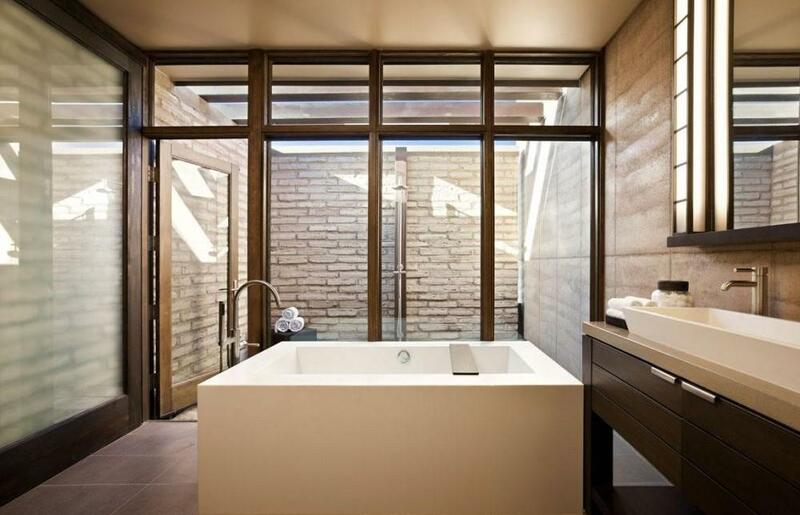 For example, rammed earth walls, made from the desert’s sandy soil, not only contribute a powerful ambiance, but create thermal shells. Decomposed granite paths heighten awareness by crunching underfoot, but also accommodate the rainy season with natural drainage. Patios with deep overhangs create cool caves between the walls, like canyons that shelter new life in the Sonoran. Like shade, water here is an event so rain chains serve as drain spouts to celebrate each drop. Together, these principles instill the guestrooms with a natural desert experience that honors the environment and provides people with lasting feelings of well being. Sustainable elements are inherent throughout the design and construction of these buildings. 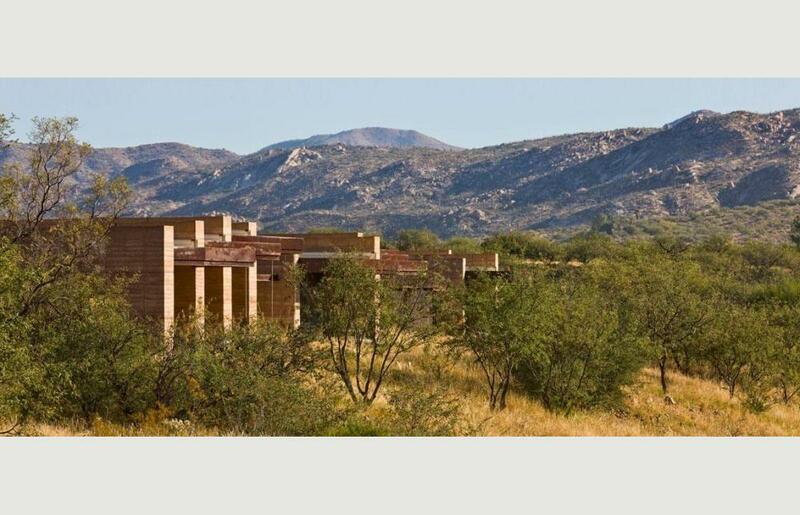 From the adobe brick and rammed earth walls to the rooftop solar panels, the design takes advantage of every opportunity to conserve energy while enhancing the residents’ ability to access their beautiful surroundings. 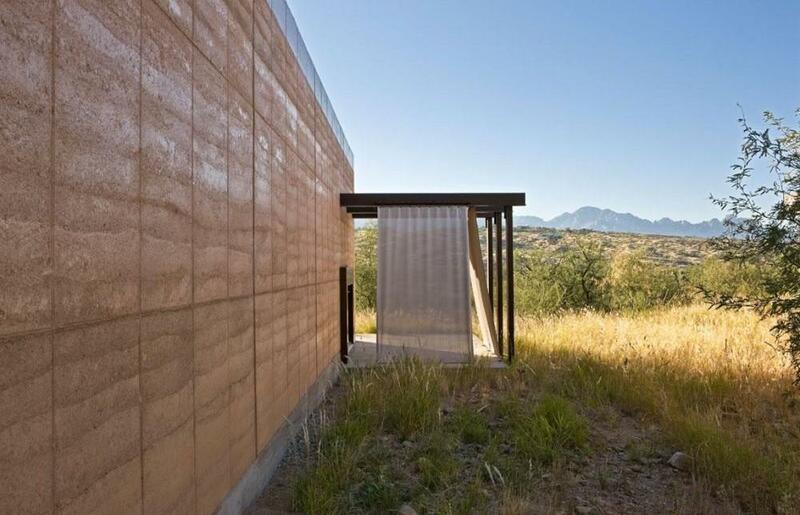 The rammed earth walls provide a thermal mass that collects heat and cools interiors during the day, and then re-radiates it to warm interiors at night. At the same time, high-albedo roof coating decreases air-conditioning energy use. Highly reflective, it reduces the absorption of solar energy, surface temperatures and heat transfer into the building. Solar systems on roofs in turn absorb heat in order to provide high volumes of hot water. Low-flow plumbing fixtures, including toilets and faucet aerators, save substantial amounts of water compared to conventional fixtures. A future on-site treatment plant will reclaim waste water for landscape and irrigation use. Buildings are open to natural light and views. Operable windows and open layouts promote natural ventilation. Preserving the pristine quality of the desert air, all paints are non-toxic and low VOC (volatile organic compounds). Native plant species were selected to match the unique Sonoran habitat and do not require irrigation. With sensitivity to the existing landscape, building locations preserved old growth Saguaro cacti. Growing only one inch per year, the largest on site, with eight arms, is estimated to be more than 120 years old. Thoughtful attention to social and psychological sustainability (i.e. 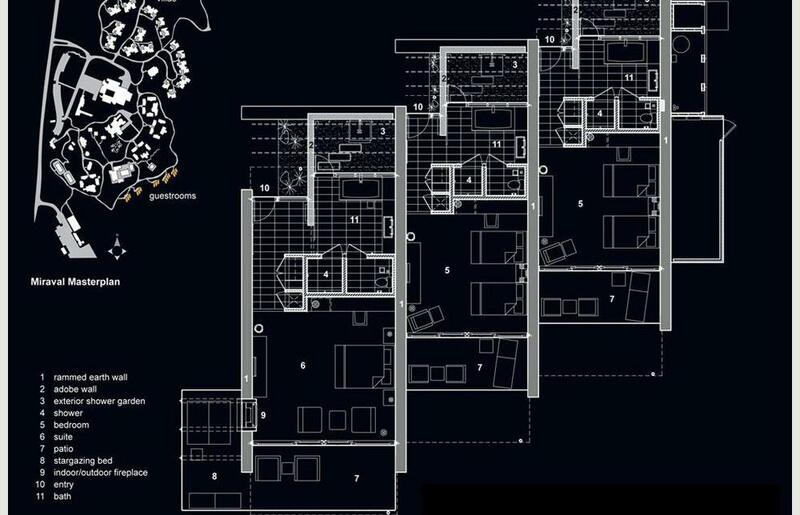 the implications of programmatic success and lasting memories) has resulted in buildings carefully oriented to optimize daylight and views and blend with the horizon. The creation of a strong connection to the Sonoran Desert landscape is crucial to giving people a deep sense of well being and achieving Miraval’s “Life in Balance” mission.